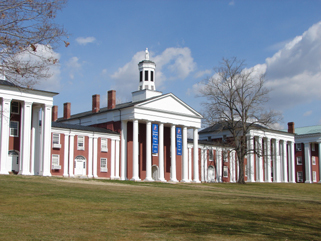 Washington and Lee University is among the oldest and most distinguished liberal arts colleges in the country. Designated as a National Historic Landmark, the campus is historically significant for its early nineteenth century and early twentieth century campus designs. Historic buildings have been preserved and adaptively reused from throughout the university’s history. George Washington is associated with the university through his early financial contributions. Robert E. Lee served as the university’s president following the Civil War. Lee was directly responsible for the pastoral landscape that characterizes the Front Lawn of the campus as well as for construction of the President’s House and Lee Chapel, where he and his immediate family are entombed. 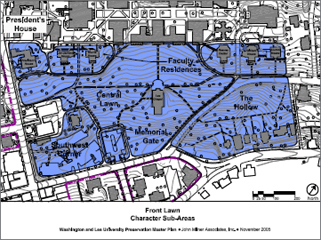 The preservation plan for Washington and Lee identifies significant landscape character areas on the campus and the character-defining elements that are significant to them. Design guidelines are provided for the strengthening of landscape character and the removal of non-contributing elements. Maintenance guidelines are provided for the ongoing stewardship of historic buildings and landscapes, preserving historic character while accommodating needed change.